Video emerged of a group of Argentines in New York celebrating their high school reunion before the terrorist attack that killed them. The group of men was riding bicycles along the Hudson River in the lighthearted video clip. Later, they would be killed or injured by terrorist Sayfullo Habibullaevic Saipov. 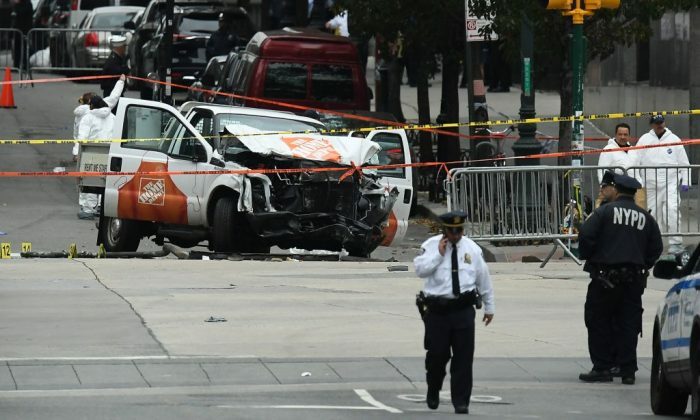 Saipov drove a rented truck along the bike path and killed five of the men, along with three others, in his Oct. 31 attack, which is being hailed as the worst terrorist attack in New York since 9/11. The Argentines came to New York to celebrate their high school reunion and graduating from Instituto Politécnico, a technical high school in Argentina, 30 years ago. One surviving member out of six is recovering in the hospital. He has not yet been informed of his former schoolmates’ deaths, the Daily Mail reported. Vigils were held at the men’s Rosario, Argentina, high school and the school announced a week of mourning. Argentina’s President Mauricio Macri issued a tweet with his feelings on the deaths of five Argentine citizens. “Deeply moved by the tragic deaths this afternoon in NY. We have made ourselves available to the relatives of the Argentine victims,” wrote Macri. “Just spoke to President Macri of Argentina about the five proud and wonderful men killed in the West Side terror attack. God be with them!” said President Donald Trump in a tweet. The three other victims to die from the attack include two American men and one Belgian woman. The men were young professionals that worked in New York City. The Belgian woman was a mother of two young children who was traveling in New York with family members at the time of the tragedy, CNN reported. Trump recommended the death penalty, and also recommended sending Saipov to Guantanamo Bay. Saipov reportedly bragged about what he did to investigators, and even wanted an ISIS flag placed near his hospital bed, Fox News reported.